During my junior year of college (see the About Me page for all the details), I took an introductory course to chemical engineering thermodynamics. It was quite challenging, but fascinating nonetheless. At the end of the course, we had an opportunity to present a creativity project for possible extra credit points. As the end of the semester approached (and my grade in the class remained in limbo), an idea sprang to mind. What if I made a video where I asked people what their thoughts were on thermodynamics? Surely it would be interesting. And thus my mini documentary/video making hobby began. I quickly gathered my thoughts, and headed downstairs to the lobby of my residence hall to grab some interviews from some first year students. The interviews went well, but I decided to take it a step further and ask some of my thermodynamics classmates the same questions. Finally, I headed to the departmental offices and filmed some of my professors’ responses to the questions. The result was the video below, which sparked my interest in small-time video editing. Keep in mind this was the first video of its kind for me, so the writing and my appearance are a bit rough, but all in all it will make you laugh, especially if you have a background in chemical engineering. 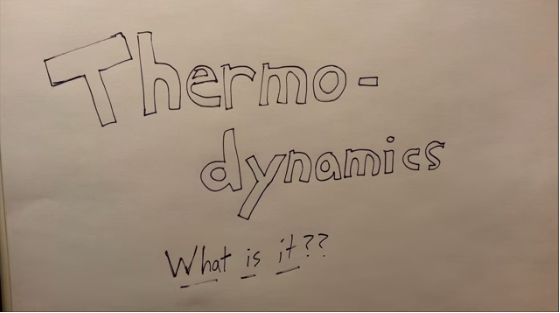 So here it is, my first film of college, Thermodynamics: What is it? The video has since experienced mild success on YouTube. It now has over 3,000 views, and is still a favorite of mine to share with aspiring chemical engineering students. I’m looking forward to sharing the video with other chemical engineering students throughout my graduate school career, and generally through my whole career (wherever it takes me). Note: For those of you who lack a chemical engineering background, you’re probably super confused by Dr. Hall’s response to my question when she refers to “little green bots.” This was a scripted move on her part, since she was the instructor of the class I submitted this video for, and she was the only interviewee in the entire video who had time to prepare for the questions before I asked them. As an extra credit project for my Thermodynamics 1 (CHE 315) class at NC State University, I decided to ask students what comes to mind when they hear the word “thermodynamics,” as well as give me a definition of the word. The results were interesting. Interestingly enough, I filmed all the video scenes with the camera on my Samsung Galaxy S3 and edited the project in Windows Live Movie Maker. For small time projects, I can highly recommend Movie Maker, but I have since moved on to Adobe Premiere Elements, which is much more flexible and powerful for small films like this. I hope you’ve enjoyed the video and this post, and please feel free to share it with your friends!